This species is accepted, and its native range is S. Tanzania to N. Mozambique. Small shrub, glabrous except for the sepal margins; branches slender, finely striate. Leaves 3-foliolate; leaflets 4–6.4 x 1.5–3 cm., lateral leaflets somewhat smaller, narrowly ovate to ovate, apex acuminate, mucronate, base rounded or obtuse, nerves in 6–7 pairs, not prominent; petiole up to 3.3 cm. long; petiolules up to 5.5 mm. long. Inflorescence of axillary, corymbose racemes collected towards the ends of the branches; peduncles 1–2 cm. long, slender; pedicels up to 2 cm. long, slender; bracts trifid, c. 1 mm. long, subulate. Receptacle 3.5 mm. long, 1.5 mm. wide at the mouth, cylindric, with a denticulate-undulate rim 0.5 mm. wide at its lip within. Sepals c. 8 x 3.5 mm., oblong-elliptic, rounded at the apex, mucronulate, densely papillose at the margin. Androgynophore the same length as the receptacle. Stamens 25–30; anthers 1.5 x 0.75 mm., oblong. Ovary on a gynophore c. 1.75 cm. long, oblong-cylindric; ovules c. 20 on 2 placentas; stigma sessile, capitate. Fruit not so far known. Shrub with brittle twigs, glabrous but for the margin of the sepals. Leaves petiolate, simple or 3-foliolate; blade ovate, 3–6.5 cm. long, 1–2.6 cm. 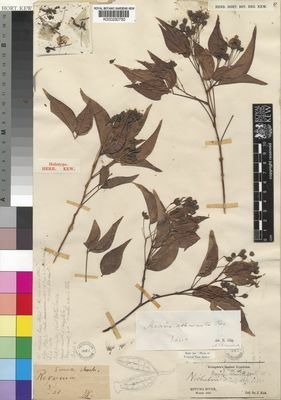 wide, acuminate, the midrib excurrent as a mucro, basally broadly cuneate to rounded, papery, coppery-green above, paler beneath; petiole up to 3.5 cm. long. Inflorescence a short lateral or terminal corymbose raceme; pedicels slender, stiffly spreading, ± 1.5–2 cm. long. Sepals ± 6–7 mm. long, marginally tomentellous; receptacle narrowly cylindrical, ± 3 mm. long; disk with a free rim up to 0.75 mm. long, unevenly dentate. Stamens about 25; filaments 1–2 cm. long. Ovary ellipsoid-cylindrical, ± 2 mm. long at anthesis; stigma capitate. Deciduous bushland or riverine forest, often on sandy soil; 550–660 m.
Elffers, J., Graham, R.A. & Dewolf, G.P. (1964). Flora of Tropical East Africa, Capparidaceae: 1-88. Exell, A.W. & Wild, H. (eds.) (1960). Flora Zambesiaca 1(1): 1-336. Royal Botanic Gardens, Kew. Wild in Flora Zambesiaca 1: 219 (1960). J.P.M. Brenan, Check-lists of the Forest Trees and Shrubs of the British Empire no. 5, part II, Tanganyika Territory p. 117 (1949). Gilg in A. Engler & O. Drude, Die Vegetation Der Erde, IX, Pflanzenwelt Afrikas 3(1): 250 (1915). Gilg & Bened. in A. Engler, Botanische Jahrbücher für Systematik, Pflanzengeschichte und Pflanzengeographie 53: 246 (1915). Gilg in Die Pflanzenwelt Ost-Afrikas und der Nachbargebiete, Theile C: 186 (1895). Oliv. in Flora of Tropical Africa 1: 85 (1868).